New York (September 14, 2016) – Swiss Institute (SI) announced today that it will be relocating to a new long-term home in New York City’s East Village, moving into a building at the corner of St. Marks Place and Second Avenue. The organization has selected Selldorf Architects to design the renovation of the 7,500 square foot building, due to open in the Spring of 2017. In conjunction with this announcement, SI is pleased to welcome nine new Trustees to its Board: Bice Curiger, Matthias Dettling, Alexandra Economou, Sam Keller, Lisa Schiff, Dominique Lévy, Christian Marclay, Michael Ringier, and Iwan Wirth. 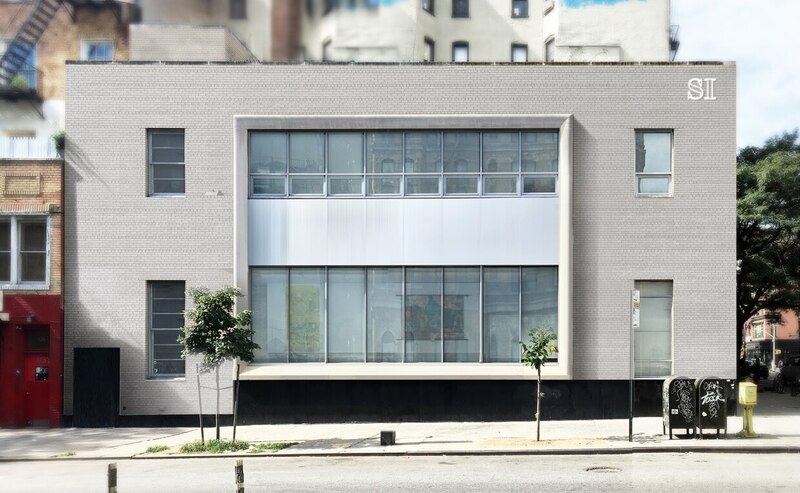 Swiss Institute has hired Selldorf Architects to oversee the transformation of its new building. The 7,500 square foot space features four levels – basement, ground, second floor, and roof. The design for the building will create spaces for exhibitions, projects and public programs, a library, a bookstore, and a usable rooftop. SI’s new home is located within half a mile of several prominent cultural and educational institutions including Anthology Film Archives, Cooper Union, Danspace Project, ICP, La MaMa Experimental Theatre Club, New Museum, New York University, The Poetry Project, and The Public Theater. Bice Curiger, Co-Founder and Chief Editor of Parkett and Artistic Director of the Fondation Vincent Van Gogh Arles. Matthias Dettling, Head of the Culture and Education Department at the Consulate General of Switzerland in New York. Alexandra Economou, philanthropist and art collector. Sam Keller, Director of the Fondation Beyeler, Riehen/Basel. Lisa Schiff, President and Founder of advisory firm Schiff Fine Art. Dominique Lévy, Founder of Dominique Lévy Gallery. Christian Marclay, visual artist and composer based in London and New York. Michael Ringier, Chairman of Swiss media company Ringier AG. Iwan Wirth, President and Co-Founder of Hauser & Wirth. Founded in 1986, Swiss Institute (SI) is an independent non-profit contemporary art institution dedicated to promoting forward-thinking and experimental art making through innovative exhibitions and programs. Committed to the highest standards of curatorial and educational excellence, Swiss Institute serves as a platform for emerging artists, catalyzes new contexts for celebrated work, and fosters appreciation for under-recognized positions. Open to the public free-of-charge, Swiss Institute seeks to explore how a national perspective can foster international conversations in the fields of visual and performing arts, design and architecture. Swiss Institute programming is made possible in part with public funds from Pro Helvetia, Swiss Arts Council, the New York State Council on the Arts, with the support of Governor Andrew Cuomo and the New York State Legislature, and the New York City Department of Cultural Affairs in partnership with the City Council. Main Sponsors include the LUMA Foundation, the Andy Warhol Foundation for the Visual Arts, and Friends of Swiss Institute (FOSI). Leading Partners include UBS and Victorinox. Swiss Institute gratefully acknowledges Stella Artois as Benefactor, Swiss Re as Public Programs Sponsor, Vitra as Design Partner, SWISS as Travel Partner and Uovo Fine Art as Relocation Partner. The Swiss Institute Board of Trustees is composed of Chair Maja Hoffmann, Honorary Chair H.E. Ambassador Dr. André Schaller, Secretary Hans F. Kaeser, Esq., Fabienne Abrecht, Daniel Baumann, Francesco Bonami, Bice Curiger, Matthias Dettling, Alexandra Economou, Sam Keller, Dominique Lévy, Christian Marclay, Richard Phillips, Michael Ringier, Lisa Schiff, Susanne von Meiss, Iwan Wirth, and Daniel Wuersch. On Thursday, November 10, 2016, Swiss Institute will host its Annual Benefit Dinner and Art Auction at the Williamsburgh Savings Bank to celebrate two important milestones: Swiss Institute’s 30th Anniversary and the appointment of Maja Hoffmann as Chair. The Annual Benefit Dinner and Art Auction is an essential cornerstone of SI’s fundraising, with proceeds going directly to produce exhibitions and public programs. This year, SI will be presenting Artist Tribute Awards to two artists who have played key roles in the organization’s history: Olivier Mosset, who has exhibited in nine exhibitions at SI across three decades, and Jordan Wolfson, whose first institutional solo exhibition in the United States took place at Swiss Institute in 2008. Eva Presenhuber, founder of Galerie Eva Presenhuber, will be receiving the 2016 SI Award. Swiss Institute is also delighted to present the 30th Anniversary Award to Trustee Fabienne Abrecht, who has served as Chair for more than 15 years.